This single seat fighter was powered by two BMW 003 turbojets mounted side-by-side in the fuselage rear, an arrangement that most modern jet fighters emmulate. The wing was mounted low and swept back. 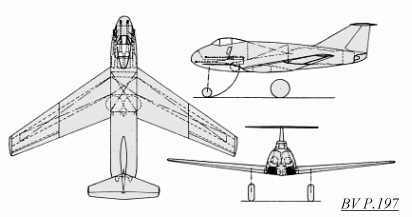 The vertical fin was also sharply swept back, with the tailplane mounted on top of the fin and rudder. Two MK 103 30mm cannon and two MG 151/20 20mm cannon were located in the forward fuselage sides.